While there are a variety of ways that you can drill a hole in the ground, the process of rotary mud drilling is by far the most popular and the most dependable. There are undoubtedly many advantages to this technique which drilling contractors in Queensland find so alluring. During the drilling process, the weight, viscosity and filtration control of the mud will keep particles from floating about as the drilling equipment bores down deep underground. This is essential because there is already some obvious resistance during the drilling process. Water, oil or gas pressures are not uncommon while drilling and the mud helps to overcome this hydrostatic pressure that builds up. One of the biggest concerns that drilling contractors have to contend with is to avoid damaging the formations it contacts. It is a common myth that any type of drilling will cause this but mud drilling will not. Say for example you use air drilling to bore a hole. This leaves the area where the drilling took place open to contamination from other nearby elements. The mud captures these pollutants and prevents any unwanted material from damaging or contaminating the drill site. The drilling equipment must be monitored at all times. This includes the mud weight, viscosity and filtration rate to ensure that they are within acceptable parameters. This guarantees that the well formation is protected and that the drilling process is as productive as possible. Holes that are bored with mud have a far lower filtration ratio and can be done faster than other drilling techniques. In the event that circulation is lost with conventional drilling equipment, the entire operation comes to a stop. However, with mud drilling, the process can continue even if there is no circulation at all. However, even with mud drilling, it is important to restore circulation as soon as possible. 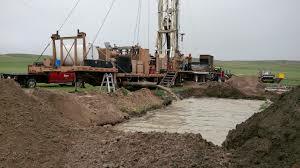 To that end, the drilling technician will create a mixture of materials which combine cellophane, paper and cottonseed hulls to the drilling mud so it can patch up areas in the boring hole that are taking in fluid. This results in the restoration of any lost circulation. It’s not to say that air drilling is inefficient. It simply means that in cases where this process has failed to produce the desired results, mud drilling is more than capable of handling and finishing the job. With mud drilling, the rotaries in the drill use mud, also known as drilling fluid, to cool down the drill bit while at the same time removing those annoying cuttings at the bottom of the well which can affect productivity. The mud contains a variety of ingredients but the most common ones used are polymer and bentonite. As the drill bores deeper into the crust, the mud will make its way back to the surface and gets collected in something called a mud tank. Once the cuttings settle, the mud can be reused. Rotary mud drilling is the perfect choice if you’re afraid of having wall stability issues while boring a hole. The drilling mud is a great stabilizer and it is that same reason that the drilling industry in Queensland is so fond of the technique.